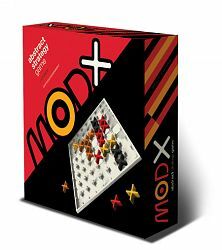 MOD X, an exciting new abstract strategy game that will test any player’s tactical thinking skills. This original new game is easy to learn, deep and strategic, and provides hours of fun. MOD X features a unique game board where players try to score points by creating x's, crosses, or five-in-a-row sequences with their color game pieces. Players get fifteen colored game pieces and eighteen score markers to mark where they completed one of the three patterns needed for scoring. The first player to reach the established point cap, determined by the number of players, is the winner! MOD X players have the challenging task of stopping each other from creating patterns while trying to build their own to rack up points. Score markers indicate where patterns have been made, but they can be lost to competitors who build new patterns over them. The game ends when one player reaches the established number of points, or when a player runs out of pieces.